The distinguishing characteristic of this species is the leaves, which appear together like the fingers of a hand. 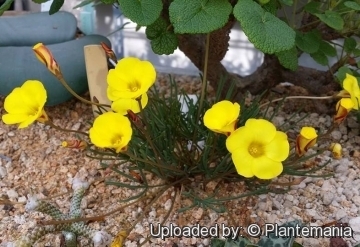 Origin and Habitat: Namaqualand to the southern Cape, Republic of South Africa. Habitat and ecology: Oxalis flava grows on flats and lower slopes, often on sand. Reports from many parts of South Australia indicate that this species is spreading rapidly from cemeteries and gardens. It has already formed open paddock infestations near Port Lincoln. 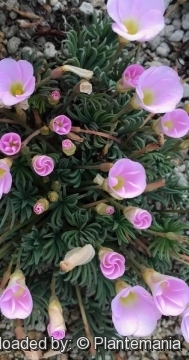 Oxalis flava var. pectinata (Jacq.) Sond. 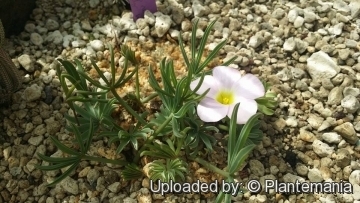 Description: Oxalis flava is a stemless perennial with the leaves in a tuft at soil level often not fully expanded at flowering, hairless, leathery and greyish, with large brown stipules, divided into 2-12 narrow to elliptical, folded leaflets. When the leaflets are closed the foliage has a very distinct appearance from that which it has when these unfold. It bears large trumpet-shaped flowers of white, yellow, or sometimes pale lilac, only one on each stalk. This species is autumn blooming. 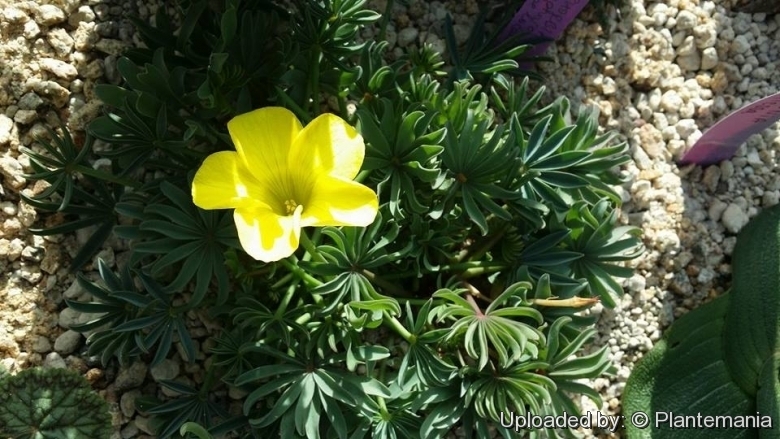 Oxalis flava is very variable with many different varieties or forms often referred as a species-complex. Bulb: Bulb ovate, about 1-3 cm broad ovate consisting of a smooth, crustaceously membranous covering and a white kernel of the consistence of an almond. When young, the bulbs of Oxalis flava are pink and round. Stem: Very short mostly underground or more or less elevated above the ground, scaly. 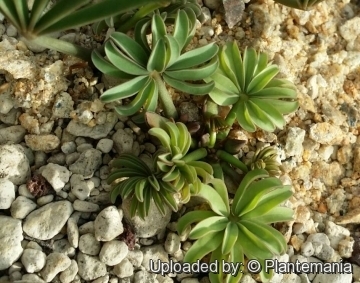 Leaves: 5 or more terminal in a tuft at soil level, palmately arranged, leathery, slightly succulent, smooth and greyish-green, with large brown stipules. Petiole 2.5-5 cm long, thick, compressed, terete, mostly reddish, 2.5-10 cm long, channelled. Leaflets (2-)5-9(-12), oblong-linear, linear to elliptical, channelled-connivent, each at first folded lengthwise, then expanded, obtuse or acute, with a small point, minutely dotted paler at the under side, 1.5-5 cm long about 2-6 mm broad. Inflorescences: Peduncles several, slender, equalling or excelling the petioles, jointed at the base, one-flowered, having two small bractes placed alternately near its top. Cultivation and Propagation: This is a winter/spring-grower, but can grow all year. It responds well to cultivation, making a superb, well-packed display of flowers in a pot or pan, under frost-free or alpine house conditions, in a loam-based compost. Reproduction: Seeds. These are produced in the typical explosive capsules of this genus that ensures the seeds are dispersed up to a few metres from the parent.